The IFF General Assembly decided in its meeting held on the 26th of May 2006 in Stockholm, Sweden, that one of the major goals of the IFF in the next two years is to receive the IOC recognition in 2008. Since the International Floorball was founded in 1986 by the Swedish, Finnish and Swiss Association, the development of the sport has been amazing and Floorball is today one of the fastest growing sport in a number of countries, due to the easiness to start playing and the speed of the game. The number of member countries in the International Floorball Federation have continuously increased, the latest member being Sierra Leone, the first Member Association from the African continent. Also the number of Floorball players and Floorball clubs in the world has continued to increase in 2008. 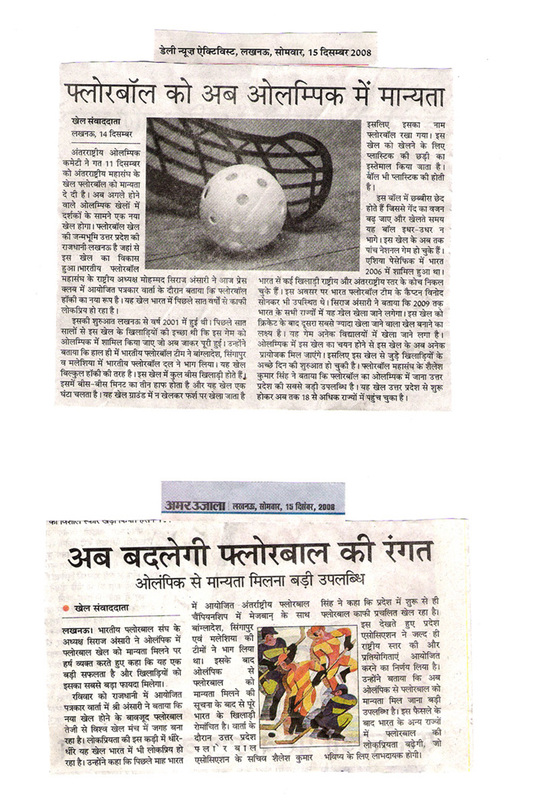 Floorball has nearly 300,000 licensed players and a total of 1, 9 million recreational players in the world. Floorball also meets the requirements of attracting the youth, being a well organised sport and attracting equally men and women. The Central Board of the IFF is very thankful towards the entire Floorball community, for the great effort they have done, enabling us to receive this recognition. Floorball Sport Now Into Olympic, Recognised by IOC. Mohd. 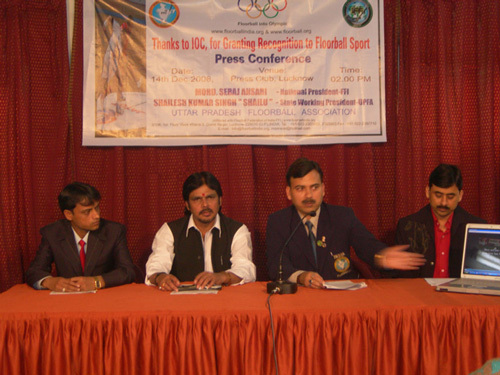 Seraj Ansari National President Floorball Federation of India is addressing the Press Conference at U.P. Press Club, Lucknow briefing about Recognition of Floorball Sport by the International Olympic Committee at their Executive Committee Meeting held at Czech Republic on dated. 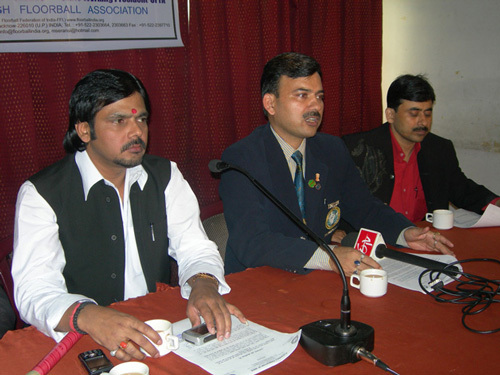 11th Dec.-2008 Mr. Shailesh Kumar Singh (Shailue) State working President-U.P Floorball Association & Mr. Mohd. Meraj Founder Member-Floorball Federation of India, and Mr. Mohd. 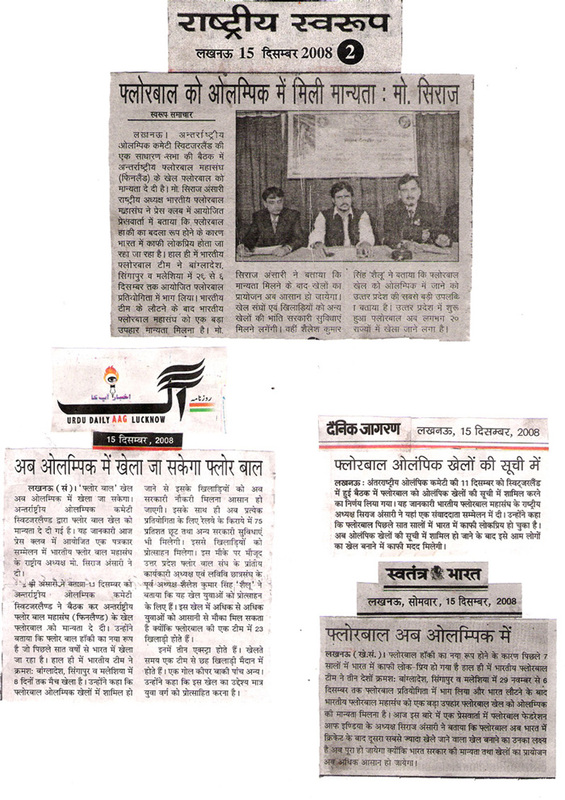 Nasim-State Secretary-U.P. 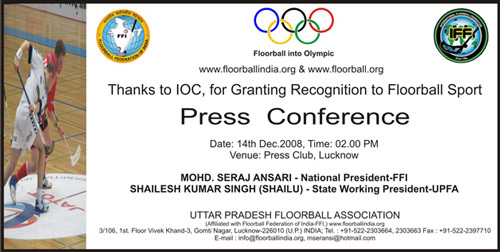 Floorball Association is also in seen on the Press Conference on 15-Dec.2008 at Lucknow, India. Mr. Mohd. Seraj Ansari National President Floorball Federation of India is answering questions of E-TV National Channels about floorball into Olympic. 1 - IFF-Press Release-IOC Recognition Copy (PDF-FILE), click to download. 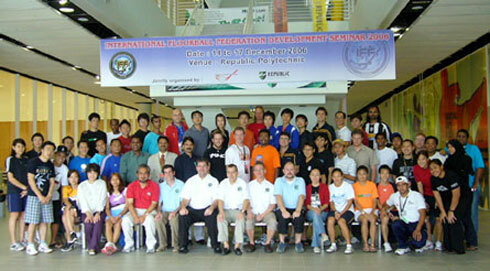 2 - FFI-Press Release-IOC Recognition Copy (JPEG-FILE), click to download. 3 - FFI-Brief-2008 (WORD-FILE), click to download. 3 - FFI Press Articles, click here..( 1 ), ( 2 ) , ( 3 ) .